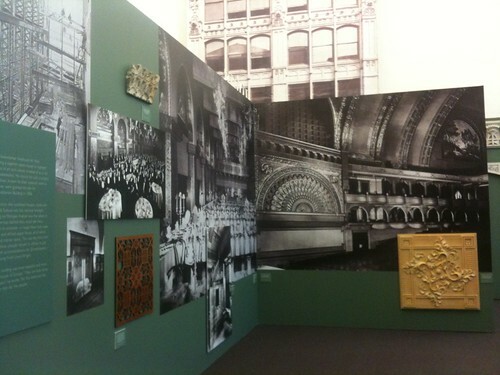 The Chicago Cultural Center current display of Louis Sullivan works is not to miss for anyone interested in architecture or history. Sullivan, an architect, was a leader in Chicago’s rebuilding post the Great Chicago Fire. With blocks of stores, factories and home decimated, he had a clean slate to design and build his modern works. Sullivan began using steel to create high-rise buildings as an inexpensive and versatile building material. Many of the buildings highlighted are no longer standing including the Transportation Building from the Colombian Exposition and the White City era. The iron gates and photos are all that remain from Chicago Stock Exchange. There are a few of his works still standing. I graduated twice in the ornate Sullivan designed Auditorium Theater now part of Chicago’s Roosevelt University. Over sized photos show the Theater Building crowded with tables. The former Carson, Pirie, Scott store on State Street with the decorative iron work is one of my Sullivan favorites. In this exhibit, descriptive text combines with two story prints of the buildings designed by Louis Sullivan and large chunks of now torn down buildings. Walking through the installation, I felt as if I was strolling down the streets of Chicago during the early 1900’s. Unlike most museums, the molded concrete and steel segments of once stately buildings are at hand and eye level for visitors to see and touch. Beyond the building remnants stand photos of the building where you can see the segments as they were. If you visit Chicago’s Graceland Cemetery, stop by to see Louis Sullivan’s final resting place. This free exhibit runs Jun 26, 2010 – Jan 2, 2011.